More about Yancey Origins - click here. Some of the information below about the Yancey Family may be nothing new to you. This information is being compiled to help people correct the large amount of mis-information and blatantly wrong facts that are often passed around concerning the earliest Yanceys. 1) The farther you go back - the higher the chance of bad information. In virtually any family tree the part of the family tree that will most likely have the greatest amount of MIS-INFORMATION - will be information concerning the earliest members of a branch of the tree (such as the earliest Yanceys of America). Be cautious about information that you can't seem to back up with primary or secondary sources. Realize that in most cases the highest raste of errors in your family tree will usually be found in reference to its very earliest and most obscure ancestors. After nearly 30 years of research and reviewing the research of other Yanceys traversing a period of over 100 years - I have found that the earliest case of any documented Yancey appears to be that of one Charles Yancey on the Quit Rent Rolls of King Wiliam County, Virginia in 1704. If you find information that purports to provide information on Yanceys earlier than 1704 - use a healthy amount of common sense, and analysis to see what the original sources were for this information and how reliable it may be. Over the many decades I have found numerous cases of what were originally nothing more than wild guesses - taken by people and passed around as if it was just as accurate info as anything else recorded about the Yancey family - when it truth there seems to be virtually nothing to back it up. 3) Avoid data from LDS IGI/AF files without it being supported by other more direct evidence. Many research have copied information from others concerning the very earliest Yanceys that traces back to very suspicious and or very sloppy information submitted to the LDS IGI/Ancestral File/Family Tree databases. As an example - full birth dates for any of the children of Charles & Mary Bartlett Yancey are highly suspect and almost certainly in error. 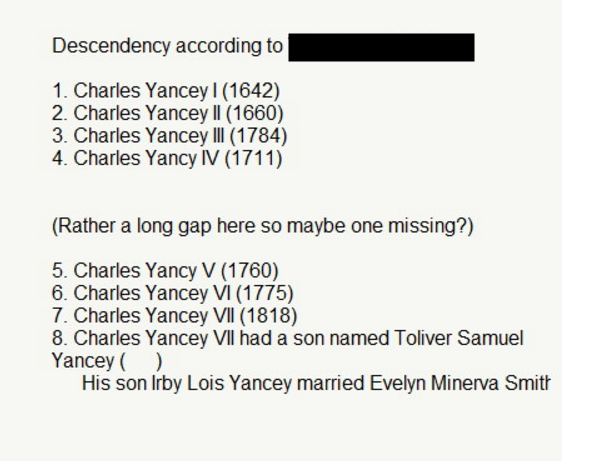 Note that the two earliest generations of Yancey that most people have recorded in their databases (Charles Yancey and Mary Leighton - and Charles Yancey and Mary Bartlett) - really have no basis in supporting evidence at all. If we do choose to include such relations in our Yancey database - one should seriously consider pointing out that there are no known supporting documents. Many purported maternal lines supposedly marrying into the early Yanceys - seem - to be totally baseless when it comes to real facts or even circumstantial evidence. Cases of this included purported connections to such families as BOLLING, THORNTON, BARTLETT, MARSHALL, LEIGHTON and others. Purported connections to the Old World. Any secondary sources that you find that allude to specific connections to the old world for Yanceys - are almost always based on someone's wild guess - that someone then entered into their database. Places like Wales, England etc - certainly may be possibilities for the Yancey ancestry - if you include possibilities in your database in the same way that you enter well documented facts in your database - people will quickly lose respect for the quality of your information. At least become familiar with WHY people may think the birth place of a specific early Yancey was - before just mindlessly copying wild guesses as if they were fact. Make it easy in your family data to differentiate between known facts and educated guesses. also note various "Yanceys" of Europe that are nothing more than "mis-transcriptons"
Note that there is no hard evidence that the Yanceys descend from the Nanneys of Wales. On the contrary genetic testing has shown in recent years that the Nanneys and the Yanceys do not share a common paternal line of descent. 7) Check around before you add questionable info into your database. Before you just mindlessly copy new info into your database on the earliest Yancey - consider asking around and getting the advice of other researchers based on what their perception and opinions are about certain claims. Learn from the research of others. Many claims about early Yanceys have proven to be false - see what other researchers have already discovered. Don't waste time rediscovering what has already been discovered. Purported connections to Sir William Berkeley and the supposed statement that the Yanceys came over in 1642 - are highly unlikely. 9) Take the time for analysis and cross checking of new info and use common sense. Use common sense and cross analysis to see that new information you are adding to your family tree - coincides and makes sense and corresponds to information already in your database. 10) Always cite your sources. And always realize that not all sources are created equal. 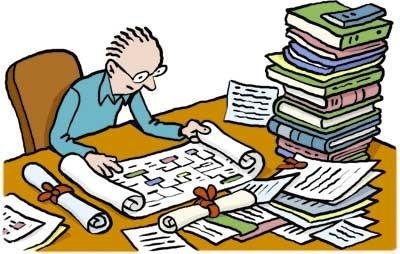 If you give an entry from the LDS IGI - the same "weight" as information from some probate document - people will realize your information can't really be trusted and is of low quality. 12) Yancey Coat of Arms? Realize that there really is no such thing as a legitimate "Yancey Coat of Arms" according to the rules of heraldy. Though I do display an arms on the Yancey Family Surname Resource Center - I do so, simply using it as a symbol for the family. BUT as I clearly state on the site - there never has been anyone by surname Yancey who was legally "granted" use of a coat of arms. There have indeed been "arms" passed down in the American family - but there origin is obscure and uncertain and apparently were never granted to someone who at the time carried the surname (they could have been arms for the Nanney family however). BE cautious of hype and misleading information passed around by marketing companies - trying to sell you Yancey Coat of arms or surname origin information. In most cases it is just downright baloney. 13) Don't just assume some information - when you know it is a guess or hypothesis - - is always better than NO INFORMATION. Case in point is the lack of information concerning Yanceys in America in the 1600's. People collect all sorts of questionable information/data purported to be in relation to Yanceys of the 17th Century. Many people just take the opinion that some possibility/clue is better to include in their files than NO information at all. They should seriously consider the possibility that there is a real valid reason WHY no information during a certain time period and place has not been found. Sometimes NO information is just as clear and even a better indicator of something than some purported possibility that is in reality almost totally baseless and potentially totally and blatantly wrong. The reason we dont find information about Yanceys in Anerica in the 1600's is most probaby because they were not here to begin with! Should someone's blatantly erroneous information take precedence over that simply because there is no informatin found to counter it?? This, below, is something I found on line in reference to someone’s Yancey line of descent. I have no clue where most of this info is coming from. Seems to me this is out right “fabrication” of names and dates (generations 1-5 at least).